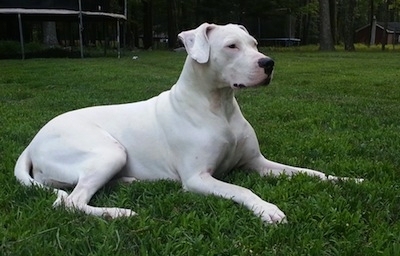 The Dogo Argentino, also known as the Argentine Mastiff, is a large, white, muscular dog that was developed in Argentina primarily for the purpose of big-game hunting, including wild boar; the breeder, Antonio Nores Martínez, also wanted a dog that would exhibit steadfast bravery and willingly protect its human companion. It was first bred in 1928, from the Cordoba Fighting Dog along with a wide array of other breeds including the Great Dane. 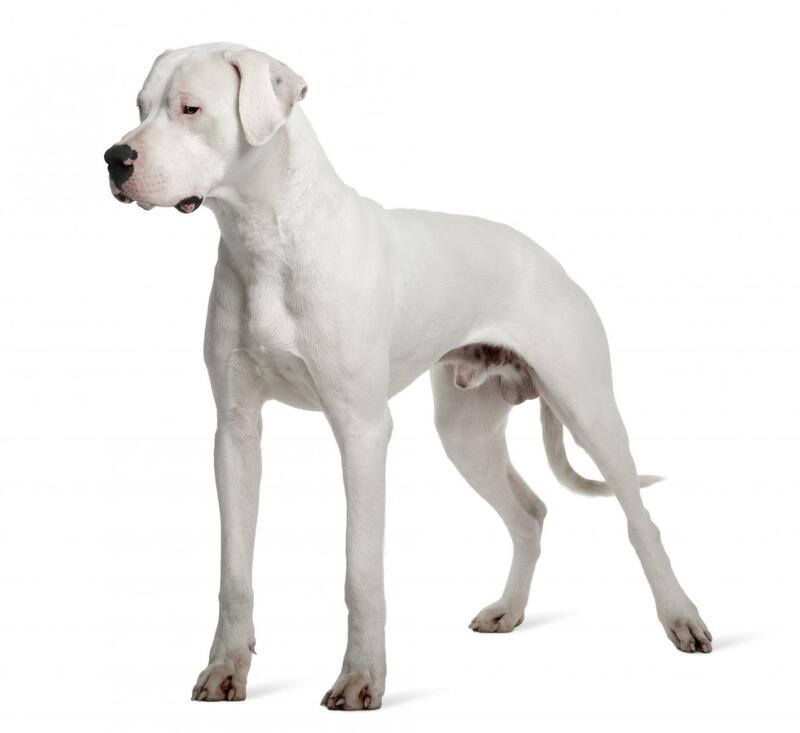 Dogo Argentinos have powerfully built well-muscled bodies. Their large heads are equipped with extremely powerful jaws designed to bite and hold on to large prey. Their necks have an abundance of skin designed to protect their necks when hunting dangerous game. The Dogo’s coat is pure white and any colored markings are considered a fault. Despite their imposing appearance, Dogos are in fact extremely gentle and loving. They are highly devoted to their masters and will willingly risk their lives to protect their human owners. Unfortunately, they are banned in certain countries like Ukraine, Iceland, Australia and Singapore. This breed was traditionally used to hunt big game in Argentina. In 1928, Antonio Nores Martinez, a medical doctor, professor and surgeon, set out to breed a big game hunting dog that was also capable of being a loyal pet and guard dog. 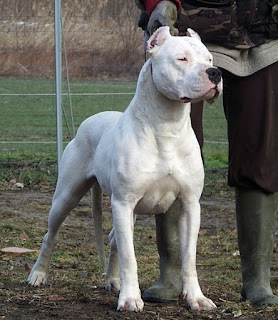 Antonio Martinez picked the Cordoba Fighting Dog to be the base for the breed. This breed is extinct today, but it was said that as a large and ferocious dog, it was a great hunter. Martinez crossed it with the Great Dane, Boxer, Spanish Mastiff, Old English Bulldog, Bull Terrier, Great Pyrenees, Pointer, Irish Wolfhound and Dogue de Bordeaux. Nores Martinez continued to develop the breed via selective breeding to introduce the desired traits. The Dogo Argentino is an amiable, outgoing, powerful breed that should never be aggressive towards people. It was bred to be gentle and protective of family members, especially children. However, it also was bred to be a strong, tenacious, fearless hunter of large, dangerous prey. These qualities are sometimes in conflict, although this breed has a remarkable instinctive ability to separate its ferociousness from its friendliness. Dogos can make excellent companions for active, experienced dog owners. Some Dogos – especially intact males – are assertive, overbearing and territorial around other dogs. However, the breed generally has a kind and loving disposition and is gentle at home, easily making the transition from hunter to companion. Dogos are terrific watchdogs, being protective and loyal to their family without showing overly-aggressive behavior. A properly-socialized Dogo Argentino makes friends easily but reacts instantly to threatening or challenging behavior from friend or foe. This breed will usually try to assert itself as Alpha over other animals and people. It is important that a clear hierarchy be established within the household so that all people and pets can coexist harmoniously. As in the Dalmatian, white Boxer, and the white Bull Terrier, the dogo may experience pigment-related deafness. There is possibility of an approximate 10% deafness rate overall with some dogos afflicted uniaurally (one deaf ear) and some binaurally (deaf in both ears). Studies have shown that the incidence of deafness is drastically reduced when the only breeding stock used is that with bilaterally normal hearing. While the Dogo Argentino was bred primarily from the extinct Cordoba Fighting Dog, it was bred to be a cooperative hunter, i.e. to accompany other catch dogs and bay dogs on the hunt without fighting with the other dogs. Aggressive traits inherent in the Cordoban Dog were specifically bred out to enable a stable cooperative nature in a pack. 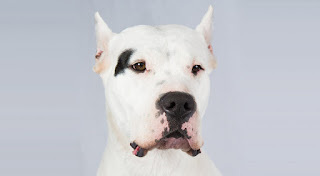 However, in areas where illegal dog fighting continues, the Dogo Argentino has been used for fighting due to its fearless nature and great stamina. Dogos of these lines are not suited for big game hunting, unlike the original Dogo Argentino. The Dogo Argentino is banned in certain countries including Ukraine, Denmark, Iceland, Fiji,Australia, Singapore and the Cayman Islands. 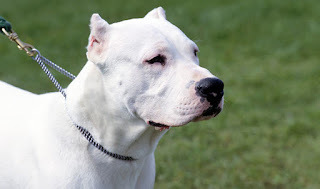 In the United Kingdom, under the Dangerous Dogs Act 1991, it is illegal to own a Dogo Argentino without lawful authority. This breed will do okay in an apartment if it is sufficiently exercised and does best with at least an average-sized yard. Be sure to bring the Dogo inside when temperatures drop below freezing. Dogos are incredibly intelligent and are quick learners. They respond well to training when it is done consistently, gently and with positive reinforcement. When given praise, rewards and affection for proper behavior, Dogos quickly learn what is expected of them. When scolded, yelled at or punished harshly, Dogos tend to withdraw and become stubborn or unresponsive. They can also become unruly with rough treatment, and sometimes turn dangerous. Basic obedience training and socialization must start at an early age for this breed. 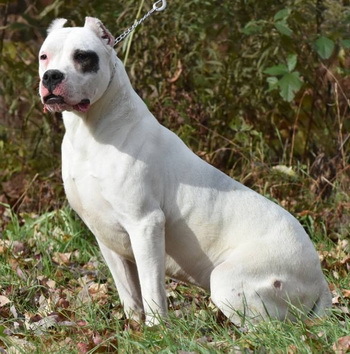 Delaying socialization can create a fearful, aggressive dog instead of the friendly yet imposing watchdog that the Dogo Argentino was bred to be. Dogos are competitive in dog sports such as obstacle coursing and disc-catching. Obedience training is fun for these dogs. They are natural heelers and want to please their owners. If bred and raised properly, they have a steady temperament and seem to adjust themselves quickly to different situations. Dogo Argentinos are highly energetic dogs and are unsuitable for owners that cannot provide them with daily, rigorous exercise. They are able to navigate various types of terrain and make excellent jogging partners. As a working breed of dog, they are also at their happiest when given a ‘meaningful’ task which they can devote themselves to. Grooming the Dogo is easy because of his short coat, though his large size means it’s a big job. A bath every three months in a mild dog shampoo is a good idea. Brush his sleek coat with a natural bristle brush or mitt once a week. Use coat conditioner/polish to brighten the sheen. The rest is basic care. His ears need to be checked every week and cleaned if needed and toenails trimmed once a month. Regular brushing with a soft toothbrush and vet-approved doggie toothpaste keep the teeth and gums healthy. It is essential to introduce grooming to the Dogo when he is very young so he learns to accept the handling and fuss peacefully. Is the Dogo Argentino the Right Breed for you? 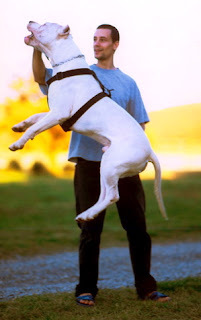 Moderately Easy Training: The Dogo Argentino is average when it comes to training. Results will come gradually. 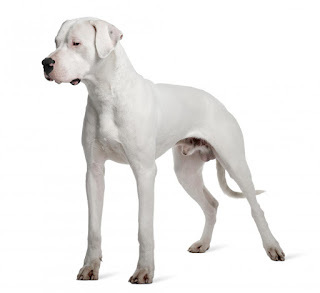 You may have heard that the Dogo Argentino is hypoallergenic. That is not true. No breed is. Allergies are not caused by a particular dog coat type but by dander, the dead skin cells that are shed by all dogs. On Animal Planet's Pit Boss episode "Shorty's Top Dog", Shorty Rossi and Hercules adopted a Dogo Argentino puppy named Mario.